Bondi of the late 60s, 70s and even the 80s was not the prime yuppie real estate haven that it is today. All of the beach going locals of the day nicknamed the place “Scum Valley”, on account of the two storm water drain pipes that emptied onto the beach at South Bondi, just below where the skate park now stands. Whenever it rained, the storm water from the surrounding street gutters drained into a large cesspit of debris, which would swell until it eventually burst its banks and partially empty itself into the surf. But, there would always remain a stagnant pool of water and debris. A brown stain of sewage sweeps to the south and into Bondi Beach. Photo courtesy of Waverley Library. The beach going public also had to deal with sewage, as there was no deep water outlet like we have today. Sewage was pumped directly into the sea from the base of the cliff below the golf course at North Bondi. Sometimes, during bad storms or when the sewage was backed up, they would release raw sewage. If the wind blew nor-easterly for a day, followed by a southerly change, sewage would be blown into the beach. This is where the term “Bondi cigars” originates! So, between the storm water drains down south and the sewage works up north, the place became affectionately known to the locals as “Scum Valley”. Another history of Bondi, by Peter Bowes. This entry was posted in Pollution by Dan Webber. Bookmark the permalink. I love this evocative description!! I can almost smell the fetid water. 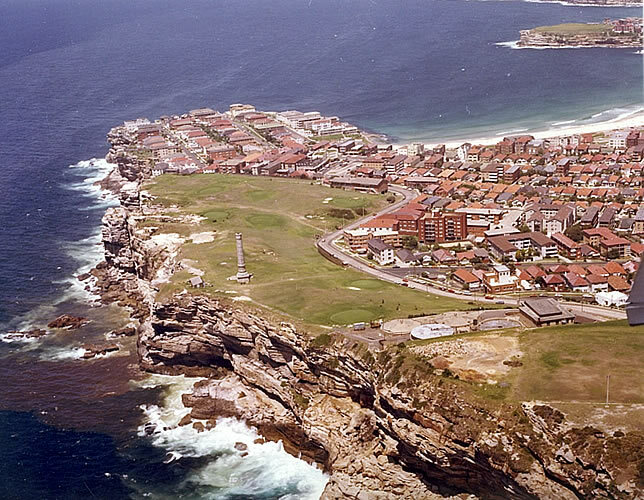 I have an aerial photograph of North Bondi c. 1960s-1970s in my collection (the Local Studies collection) here at Waverley Library which shows a thick brown ring of sewerage hanging off the coast, clearly visible from the air. Most alarmingly, right in the middle of the brown ring are lots of heads bobbing around – swimmers enjoying a day out at Bondi. I feel nauseous just thinking about it. Thank god during this era I was down the coast swimming at Bronte! The stormwater pipes were affectionaly named “the binoculars” and were made famous in the 1977 movie The Last Wave when Richard Chamberlain, the actor, walked out of one and climed down to the sand. The channel created after big storms always ensured great lefts and rights in the south corner. The removal of the stormwater to near the pool has altered the shape of the waves forever. gday ted its cookie and yeah the banks have never been the same since . cleaning up and getting rid of the” binoculars “, later to be known as the” nostrils” due to an artist painting a face on the wall and using the stormwater outlets as the nostrils on the face ,so getting rid of those was the first step in Bondi’s refurbishment ,facelift whatever term you want to use for it .the whole suburb had a facelift over 10 -15 years and turned it from scum valley to what is arguably some of Australia’s prime real estate these days as well it still remains one of the worlds most famous beaches ..
Great descriptions of the ‘binoculars’/’nostrils’!!! I have a great photo of the stormwater drain showing the graffiti (oopss aerosol art as it is now known) which gave the ‘nostrils’ its name. How do I post it here – or do you just want me to send it to you for the blog and you can put it up. Another one of my favourite pics of this time is of a dog on the beach drinking from the stormwater. 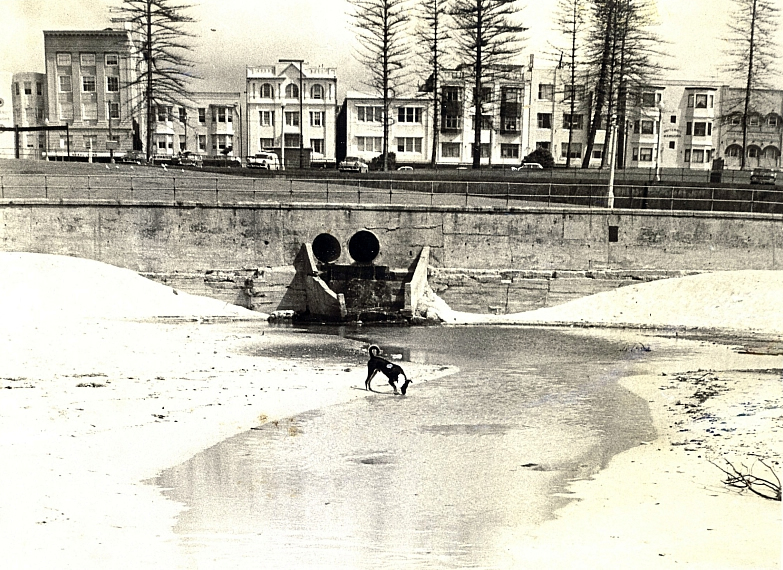 I used it in an exhibition last year with the caption – ‘showing that a dog is a brave and fearless animal, this local canine takes a drink from the stormwater drain at South Bondi in 1960.’ Do people also remember that it was called ‘the polio pit’ by Bondi locals? Before that it was also irreverently known as ‘Hogan’s Hole’ after Thomas Hogan, one of the longest serving Councillors of Waverley – three times Mayor. What Thomas Hogan thought of this has never been recorded! Kimberley, The “Polio Pit” was the revered name for the old South Bondi Boardriders Club shed just south of the first ramp. It was an old boat shed. There is a photo of Barry “Magoo” McGuigan standing in front of it in the Robert Conneeley interview by Matt Elks on Surferpedia. Dan, I’ve got a pic of Ron Adler and Roger ‘ The Rooter ‘ Mulhall posing handsomely at the door to the pit – could look good here, how can I get it to you? Re the photo of the Polio Pond at the top: all those pine trees, Harry told me one of them fell on the day of Brad Mayes’ funeral. I remember very well while in our pre teens playing in that disease pit they called the nostrils, it was nothing to throw the odd dead water rat at each other from time to time. Later as an adult we would catch large bream etc off the rocks at nth bondi, the smell and contents that came out of the fish that travelled through the merk was absolutely foul…still don’t know how people could eat those fish because no matter how well they cleaned them like even soaking them in vinegar, they still had the taste and smell of the “merk” through them…..but eat them they did. People would actually risk their lives reaching the prime spots around the rocks near the sewerage outlet to catch those prized stinkers! The decision to divide the beach to give the southern end to the board riders in about 1964 deprived myself and a lot of other body surfers of the best swimming in Bondi. We moved to the northern end where the only fun was riding dumpers. By the late 1960’s the whistling lifesavers made body surfing a joke as the board riders moved to the northern end any time, but not very often, the surf was good out the back and were not stopped. I can remember riding very large waves of about 13′ in about1963 at the middle southern end when the beach was closed. The rips always run south to north so the days were spent catching waves or riding the rip to the middle of the beach then swimming in walking back and swimming out to wait for another good wave. Poor Eren was on the prom with his fly undone back then being made fun of. I can’t remember when he started.